This is the ProTek R/C "TruTorque" Team Tool Bag. Tools are an investment that should not be taken lightly and are one of the few items that should outlast the life of the model you are working on...and remain with you for years after. But in order for your tools to last, you have to take care of them! So ProTek R/C has stepped up again, expanding its product line with an affordable, high quality tool bag that will help you keep your valuable tools in perfect working order and organized. 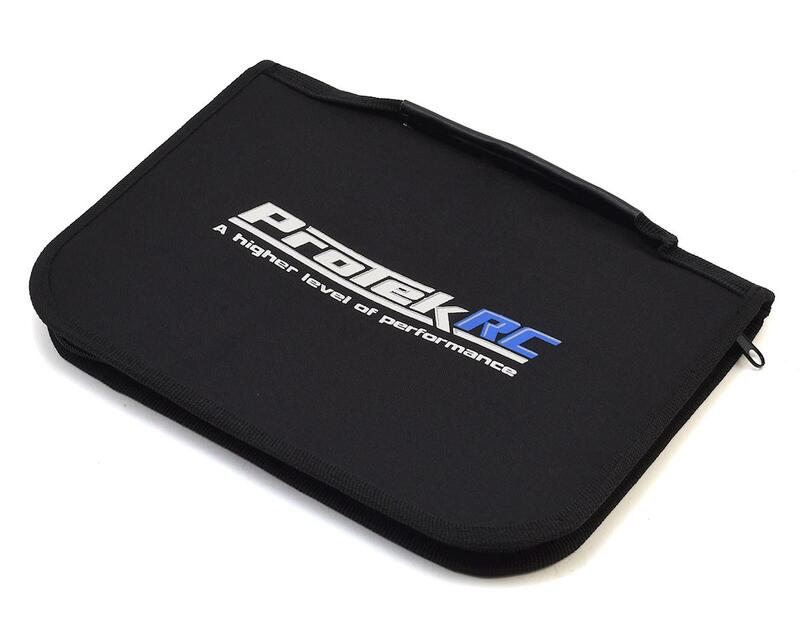 Developed with simple functionality in mind, the ProTek R/C "TruTorque" Team Tool Bag is a high quality tool bag made from durable material and is the perfect size for carrying a majority of the tools you will need for a day at the track or flying field. The bag features two sides; one with eight 'vertical' tool slots that can accommodate tools up to 8" in length, combined with two 'horizontal' slots that will fit tools up to 6.5". The opposite side has seven pocketed slots that will accommodate tools up to 10" in length. All the tool slots feature elastic compression straps that will hold tools with handles up to 25mm in diameter securely during transportation. 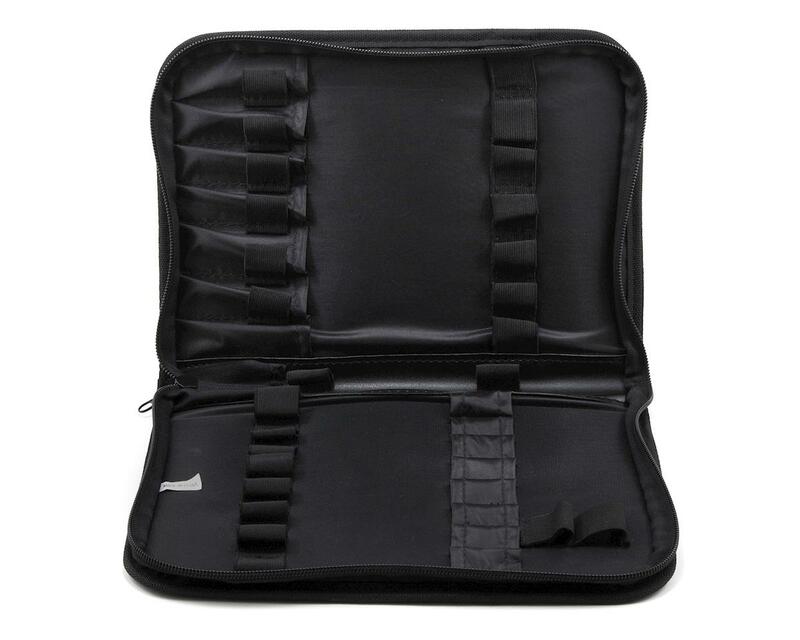 Additionally, the pocketed side of the bag also features six smaller compression straps that have been fitted between the pockets, as well as a holder fitted into the center binding, providing even more storage potential! No longer do you have to choose which tools you will bring with you, because the ProTek R/C "TruTorque" Team Tool Bag has room for 24 of the tools you need most. 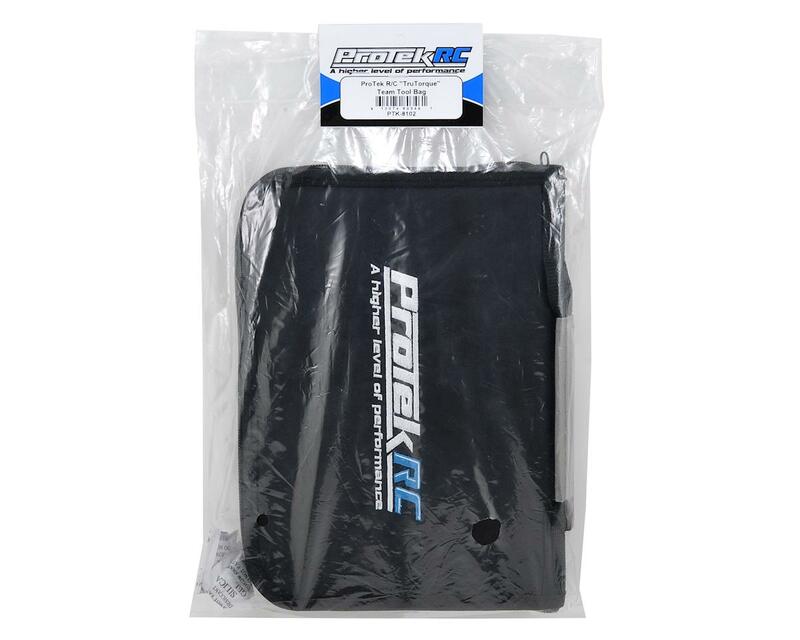 So stop hauling your tools in plastic containers, and start wrenching like a pro with the ProTek R/C "TruTorque" Team Tool Bag! I wanted to get this but never got around to it until recently. i should have got it sooner! Quality materials, lots of room and a great price!. I have mine packed with 6 hex drivers, 3 nut drivers, shock pliers, reamer, needle nose pliers, wire cutters, lexan scissors, tlr ball cup tool, tlr turnbuckle wrench, xacto knife, extra blades, tooth brush and sharpie...and there's still empty loops! Best bang for buck , and best layout of holders i have seen. I have had mine for about 2 years and its still as good as when i bought it. I am going to buy another. Wheel designed ad perfect for any brands tool set, especially Protek drivers and tools. Strong zipper to keep everything tight. Stitched incredibly strong for durability and years of use. THE BEST BANG ON YOUR BUCKS! ALL OF MY LOSI HEX DRIVER AND NUT DRIVER IN ONE POUCH NOW! PLUS IT ALSO KEEP MY LOSI REAMER AND TURNBUCKLE WRENCH! PLUS! IT ALSO KEEP MY 17MM WHEEL NUT AT SAFE! BUY THIS PROTEK RC "TRU TORQUE" TEAM TOOL BAG AND YOU'LL NEVER LOOK BACK! GOT ALSO ON SALE!!! MY TOOLS ARE MORE ORGANIZE NOW! This is an overall great product. It's great because you can throw all of your most used tools in it and take it to-go with your car. It can fit my 4 hex drivers, 2 sets of scissors, pliers, a toothbrush, 3 sharpies, tweezers, a nut driver and still has room for more. Great quality on the stitching, no problems with my bag for the 6 months I've had it. this awesome tool bag I would buy it again that 4 sure. Best tool pouch i've owned! This thing is great, finish and stitching is well done, like the fact it has a handle and it completely zips up. Has enough pouches for my hudy drivers, duratrax drivers, and my eflite drivers. Carry it with me everytime i go to the track. 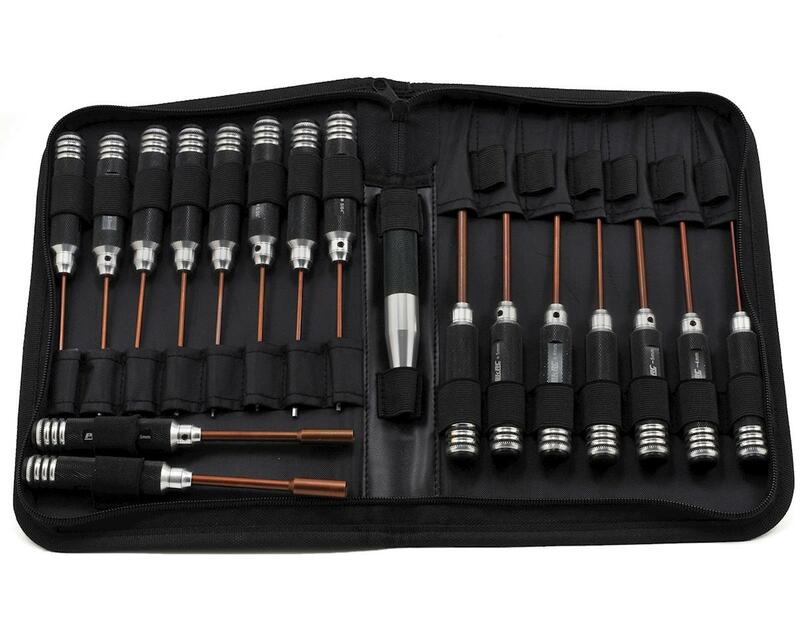 Great tool pouch at a great price. Great purchase. I fit all my wrench’s and then some. I had tools in separate plastic containers,now they are all in one bag. Good size and I like the handle on the pouch.